Transcriptional profiling of CCR2+ myeloid subsets. (A) Heatmaps of select genes differentially expressed in CD11b+CCR2+ myeloid cells sorted from P0 and E14.5 pancreas as compared with those sorted from P0 spleen, as reference. Scales on top of each gene cluster show the range of changes (bright red = highest; black = lowest). (B) Validation of differentially expressed IGF-related transcripts by RT-PCR. (C) RT-PCR of IGF2 mRNA detected in sorted CCR2+ myeloid cells isolated from P0 spleen and pancreas (red bars) versus that measured in whole mesenchymal and epithelial fractions of E14.5 and P0 pancreas or CD45–CD31–EpCAM+ cells sorted from P10 islets (mean ± SEM of triplicate samples normalized to 18S). Representative of n = 2. 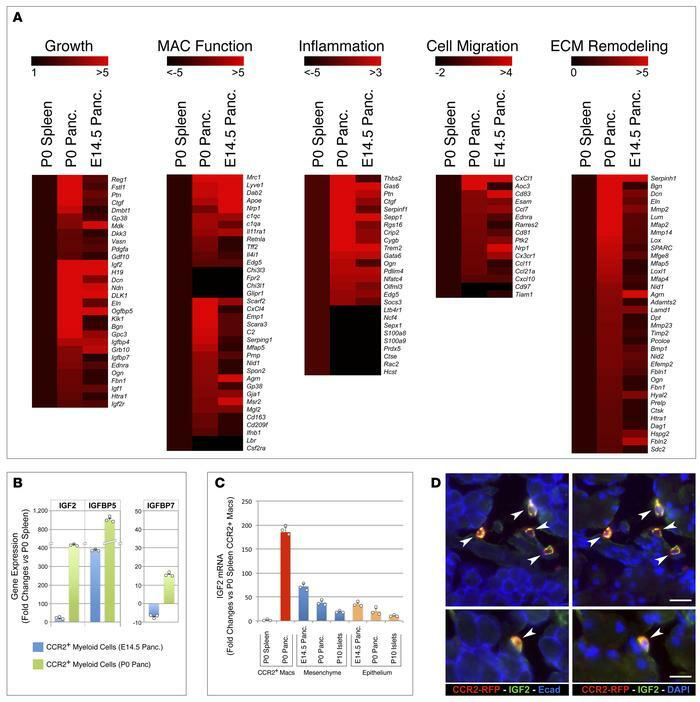 (D) IGF2 immunoreactivity in pancreatic sections of P10 CCR2RFP/WT mice highlights CCR2+RFP+ cells (arrowheads). Scale bars: 30 μm (top row) and 20 μm (bottom row). Representative of n = 3 experiments.